Adolf Cluss, “Army Medical Museum and Library,” Histories of the National Mall, accessed April 25, 2019, http://mallhistory.org/items/show/37. The Army Medical Museum and Library served as the home for the library and museum of the Surgeon General's office. The Museum was founded in 1862, but it did not have a permanent home until the building opened in 1887. 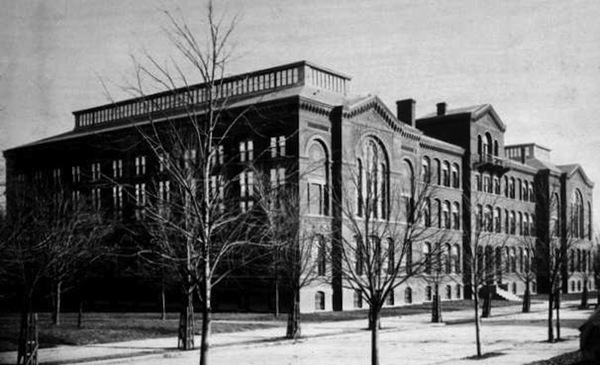 For a time, it also housed Army medical records and the Army Medical School (1893-1910). The building received National Historic Landmark status in 1964, but in 1969, it was demolished to make way for the Hirshhorn Museum. The Army Medical Museum moved to Walter Reed Army Medical Center campus. Red brick building, the size of a city block. South B Street [now Independence Avenue] and 7th Street, SW, Washington, D.C..